View across the Þingvellir rift valley. Photo: Ó. Ingólfsson, 2006. The Þingvellir area is a part of the North Atlantic rift system, almost entirely nested within the Reykjaneshryggur-Langjökull rift system. It can be described as an area of sea-floor spreading, displaying the close association of crustal rifting and volcanism. Þingvellir and the Great Rift Valley of Eastern Africa are the only sites on Earth where the effects of two major plates drifting apart can be observed. The rift zone constitutes a graben bounded by major faults. The rift valley narrows from about 20-25 km in the NE to about 10 km in the SW. The extension appears as nearly parallel fissures and down-dropped fault blocks running along the length of the valley. On the west (North American) side of the valley, the blocks step down toward the east, while the situation is reversed on the east (European) side. Thus the valley floor is a linear block that has subsided as the valley walls were pulled apart by plate motions. The valley walls are moving apart at a rate of about 7 mm per year, and during the past 9000 years the estimated horizontal extension is of the order of 70 m. The floor is subsiding at about 1 mm per year, with a total subsidence of 40 m for the past 9000 years. Rifting within the graben is episodical, with the last major earthquake activity occurring in 1789. During the 1789 earthquakes the graben floor subsidised 1-2 m.
Almannagjá is pherhaps the most dramatic structure at Þingvellir. Photo: Ó. Ingólfsson, 2005. Almannagjá is 7.7 km long. Its greatest width is 64 m, and its maximum throw is 30-40 m. It marks the eastern boundary of the North American plate. Its equivalent across the graben, marking the western boundary of the Eurasian plate is Hrafnagjá. It is 11 km long, 68 m wide and has a maximum throw of 30 m. The Þingvellir faults are believed to be the surface expressions of deeply rooted normal faults. The numerous fissures encountered on the valley floor are of similar origin. Water-filled fissures in the Þingvellir rift valley floor. The strongly faulted Mt. Ármannsfell in the background. Phot: Ó. Ingólfsson, 2005. The bedrock of the Þingvallavatn catchment is consists mostly of postglacial lavas that are most extensive in the central part of the graben and Upper Pleistocene pillow lavas and hyaloclastites of subglacial origin and sub-aerial lavas. The Þingvellir graben is surrounded by volcanoes, that illustrate the connection between rifting and volcanism. Postglacial lava flows that measure estimated 30 km3 have flown into the graben, and fissure eruptions within the graben have left their marks. The Þingvellir lava (Þingvallahraun) floors the northern part of Lake Þingvallavatn and the graben floor north and east of the lake (dark green on the map above). It originated in a major fissure eruption to the southeast of Hrafnabjörg, around 9.100 years ago. The many single flows of this lava are best exposed in the fault scarp of Almannagjá, where numerous sheets of individual lava lobes have been successfully stacked as the eruption progressed. Numerous lava lobes in Almannagjá. Photo: Ó. Ingólfsson, 2006. Mt Skjaldbreiður (1060 m) is a huge shield volcano that dominates the horizon to the north of the Þingvellir graben. It was formed during a prolonged eruption about 9000 years ago. Apart from constructing the huge shield of Mt Skjaldbreiður filling the northern part of the graben, the eruption caused a number of lava flows to enter the southern reaches of the graben (light green on the map above), partly overflowing the somewhat older Thingvellir lava. Mt Skjaldbreiður is the prototype of Icelandic shield volcanoes, due to its regularity. The angle of slope is ca. 1o in the distal parts, steepening to 9o near the top. The volume of Skjaldbreiður has been calculated to be about 17 km3, and the lava covers an area of about 200 km2. Presumably Skjaldbreiður formed during one eruption, perhaps lasting for 50-100 years. Mt Skjaldbreiður shield volcanoe, seen across the floor of the Þingvellir rift valley. Photo: Ó. Ingólfsson, 2006. 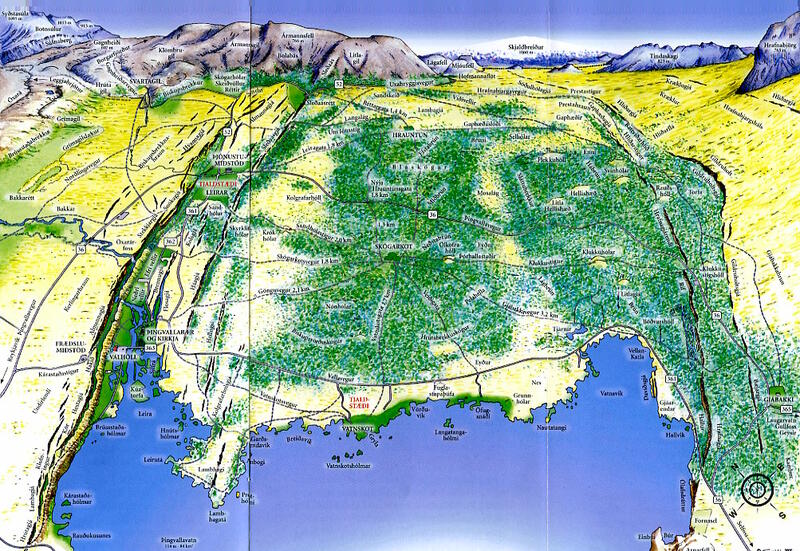 A third major eruption occurred about 2000 years later, some 7000 years ago, from the Eldborgir fissures. It produced a lava sheet that covers the eastern part of the Þingvellir lava. Together, these three eruptions (Hrafnabjörg-Skjaldbreiður-Eldborgir) filled in the graben and changed the size and shape of Lake Þingvallavatn that occupies the southern deep part of the graben. Þingvallavatn is the largest lake in Iceland, about 82 km2. With a maximum depth of 114 m, it descends about 10 m below the present sea level. It originated as a glacial lake, during the last deglaciation about 10.000 years ago. 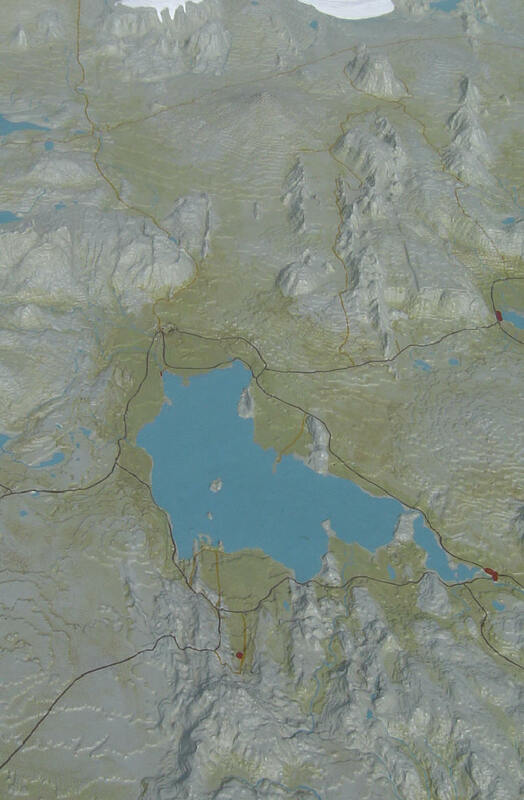 The subsequent volcanism stopped any surface runoff from the highlands to the north of the graben towards the lake. The continuing subsidence in the graben has gradually led to the present size and depth of the lake over a period of 9000 years. View from Almannagjá towards the Hengill central volcano, closing the Þingvellir graben towards south. Notice the volcanic crater island, Sandey, in the lake. Photo: Ó. Ingólfsson, 2006. The Þingvellir graben is closed towards south by two volcanic systems, the Hengill and Hrómundartindar systems. There have been 4 small eruptions within the fissure swarm north of Hengill in postglacial time: Stangarháls (early postglacial, but age not known); Hagavíkurhraun (5700-5800 years old) and Nesjahraun/Sandey (1900 years old). The Sandey crater cone formed over a fissure extending into Lake Þingvallavatn, and is the only eruption that has occurred within the lake proper. Hrómundartindar is an active volcanic system east of Hengill, with one known eruption in early postglacial time. Sunday outing in the foothills of Mt Hengill. The graben floor is covered by the Nesjahraun lava, and the Sandey cone is visible in Lake Þingvallavatn. Photo: S. Einarsson, 2006. A landscape model of Þingvellir, on exhibition at the tourist information centre in the Þingvellir national park. For orientation: Hengill central volcano at the central base, Mt. Skjaldbreiður top centre. Photo: Ó. Ingólfsson, 2006.
southwest Iceland. Journal of Structural Geology 26, 537–557. 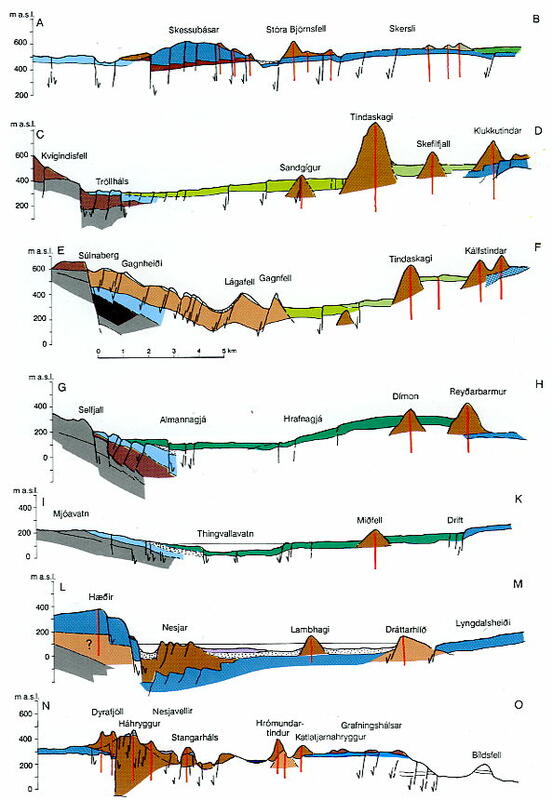 Kristján Sæmundsson 1992: Geology of the Thingvallavatn area. OIKOS 64: 40-68. Thor Thordarson & Árman Höskuldsson 2002: Classic Geology in Europe 3. Iceland. Terra Publishing, Harpenden, 200 pp. 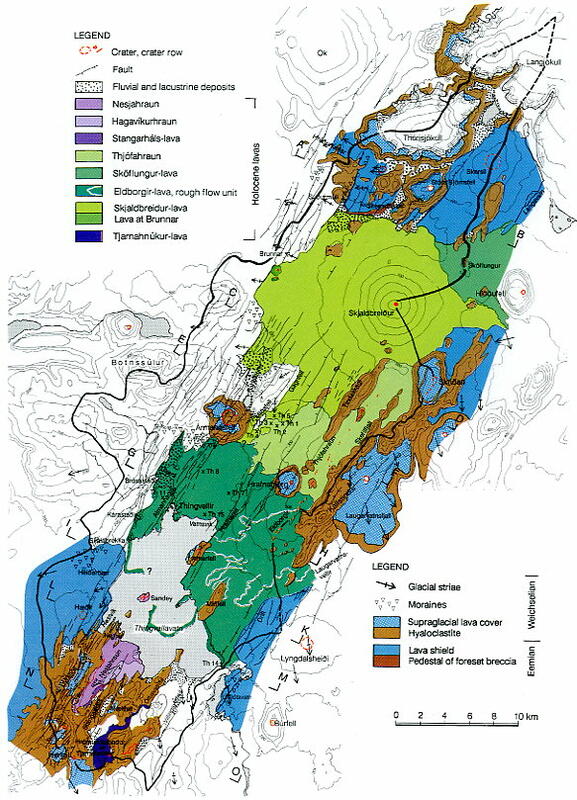 Þorleifur Einarsson 1994: Geology of Iceland – rocks and landscapes. Mál og Menning, Reykjavík, 309 pp. Almannagjá. Photo: Ó. Ingólfsson, 2005. Fissures in the Þingvellir lava. Photo: Ó. Ingólfsson, 2006. Fissures in the Þingvellir lava. The strongly faulted Mt Ármannsfell in the background. Photo: Ó. Ingólfsson, 2006. A major fault escarpment, south-western shores of Lake Thingvallavatn. Photo: Ó. Ingólfsson, 2006. The Almannagjá escarpment, seen from the floor of the graben. Photo: Ó. Ingólfsson, 2006. Lava-landscape on the graben floor. Photo: Ó. Ingólfsson, 2006. The Öxará river waterfall in Almannagjá. Photo: Ó. Ingólfsson, 2006. Almannagjá, view towards south. Photo: Ó. Ingólfsson, 2006.